One can never go wrong with a sailor themed tattoo. This is an ideal idea for those that want a smaller tattoo that can be placed anywhere on the arm as well as easily concealed when needed. Have a flare for the creative, creepy and dramatic? This right here is the tattoo for you. 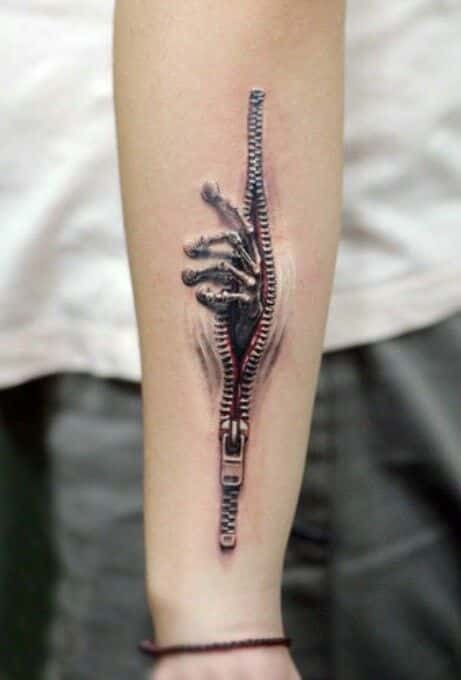 How cool is a tattoo that displays a skeletal hand reaching out of a zipper on the arm. It looks slightly 3-D while not overpowering the arm in any manner. Over lapping Aztex-like designs serve as an incredible compliment to well-formed biceps and triceps. For the man that takes a great deal of pride in his body, this style of arm tattoo will provide him the accessory that he truly needs. There is truly nothing more masculine than a man commemorating the birth of a child on his arm. The incorporation of the child’s hand and foot prints alongside their name and date of birth brings tears to the eyes of those that view it. The emotional connection behind the tattoo truly makes it invaluable. This arm tattoo covers both the outer and inner arm, and features a blue ink Buddha as its central point. The Buddha sits, smiling, at the center of the bicep. Around the Buddha swirls an array of black, blue, and deep red waves. An intricately shaded skull stretches from the deltoid to the tricep. The skull is adorned with detailed armor. On the inner arm, birds soar over a samurai sword. 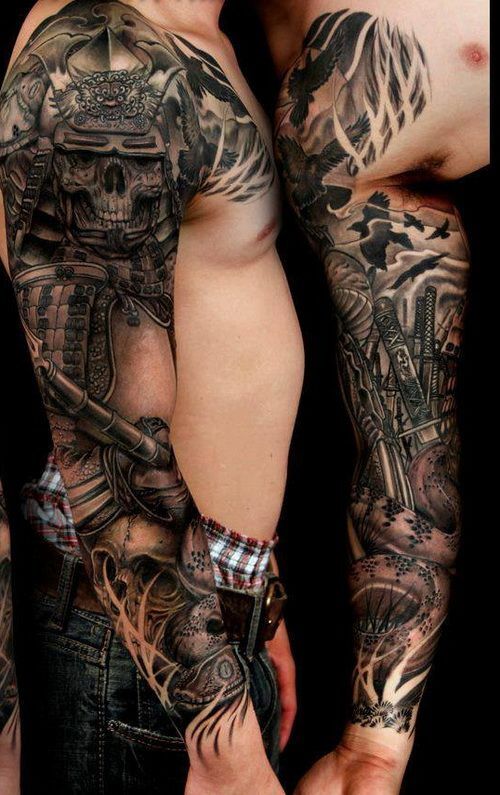 This arm tattoo is black and white and features skilled shading and detailing. 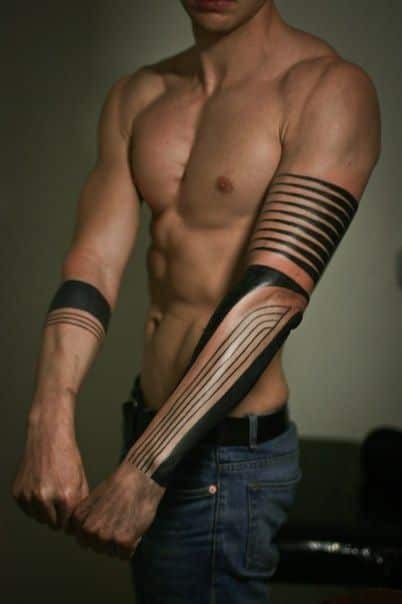 Long black lines wrap around the bicep in this tattoo idea. Two thicker black lines run down both the inner and outer arm and meet across the elbow. Between them, 5 thin lines curve to the wrist. The opposite arm features a multi-banded design just below the elbow. This arm tattoo for men resembles the mountains. 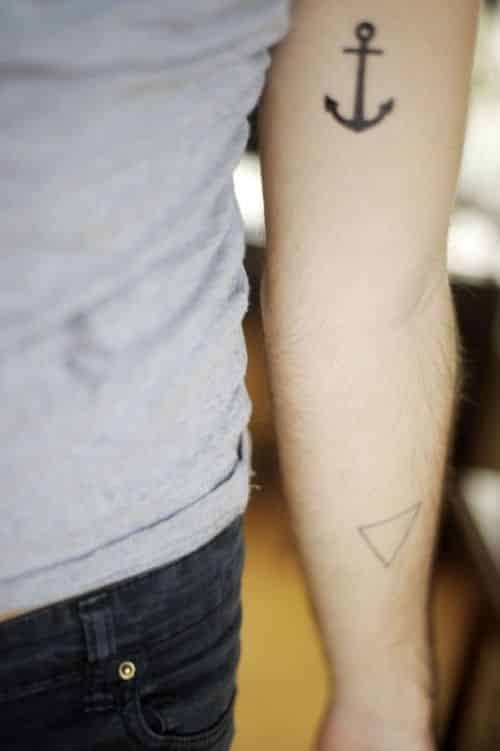 Located on the inner elbow, It features a solid black triangle eclipsing a blue and brown triangle. The blue and brown triangle is cut jagged on one side to better resemble mountains. 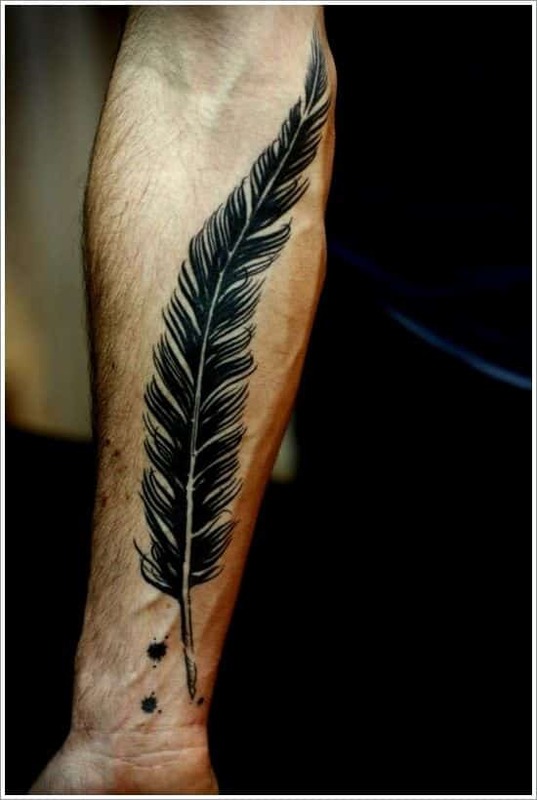 This feather tattoo is a fantastic inner arm tattoo. A large feather winds its way up the arm, from the wrist up to just above the inner elbow. 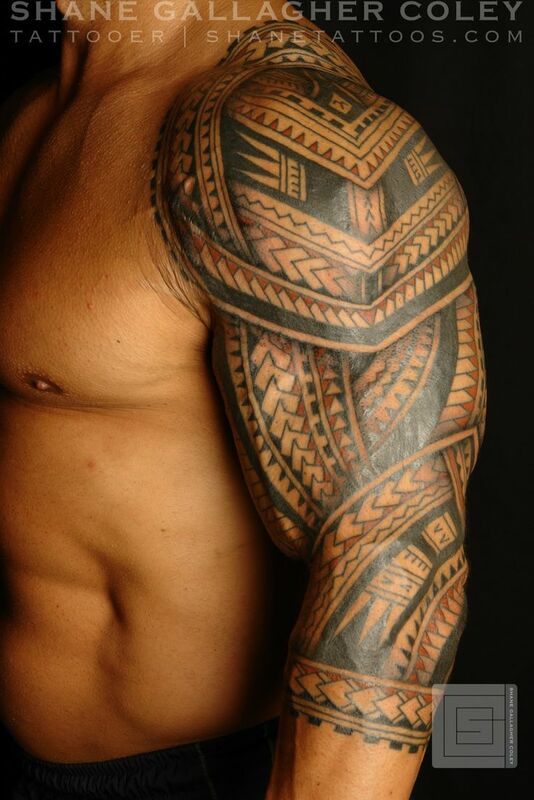 It is black, strong, and masculine looking, making it an ideal tattoo idea for men.